The secret has long been out that green tea is antioxidant-rich and packed with health-boosting benefits. Green tea comes from the plant Camellia sinensis and is so beneficial to our health due to its high concentration of epigallocatechin-3-gallate or EGCG for short. This particular antioxidant is 100 times more potent than vitamin C and 25 times more powerful than vitamin E! Studies have concluded that by drinking three to five cups of green tea a day, you can reap the immense benefits of this beverage. Regular consumption of green tea has been linked to reducing the risk of oral, prostate, stomach, breast, and pancreatic cancer. It has also proven to reduce the risk of diabetes and heart disease. The caffeine and catechins (cancer-fighting antioxidants) found in green tea can also help boost your metabolism, which makes maintaining a healthy weight easier. 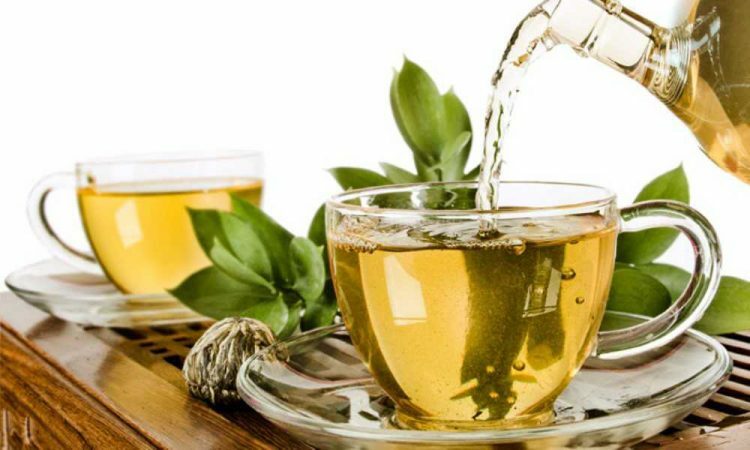 While the benefits of drinking green tea have been buzzing around the health and wellness world for eons, you might not have realized that green tea is actually beneficial to your oral health. Green tea actually helps to reduce the bad bacteria in your mouth, which is often the cause of bad breath and infections. It is a natural anti-inflammatory and anti-acid. Drinking this delicious tea will reduce the acidity in your salvia and will support gum health. Green tea is also an excellent source of fluoride, which strengthens and supports the enamel of your teeth. Stronger teeth mean fewer cavities and less of a chance of losing your teeth as you age. The antioxidants in green tea protect against cellular damage, which in turn reduces your chance of developing oral cancer. Unlike other types of tea and coffee, green tea won’t stain your teeth! Ready to brew up a cup of green tea? Green tea contains caffeine, so it is best to drink it in the morning or early in the afternoon so that it does not affect your sleep cycle.